The site is located between the Vitebsk Station and the Fontanka River in St. petersburg. On the site there is a municipal hospital, military medical museum, a number of apartment houses under state protection, a couple of business centers, and most importantly the old power station. The functional variety makes the area as a natural attraction point of the city. 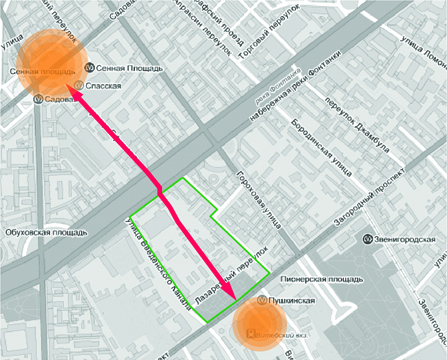 In urban scale the project aims to reconnect historical pass between Sennaya square and Vitebsk Station. 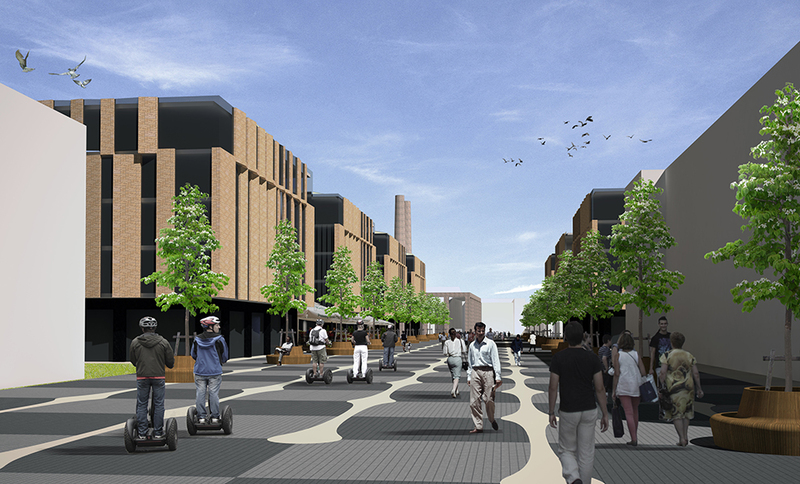 So the new development should be strung on main promenade axis. But in general the whole project is an attempt to find new identity of the northern capital of Russia. 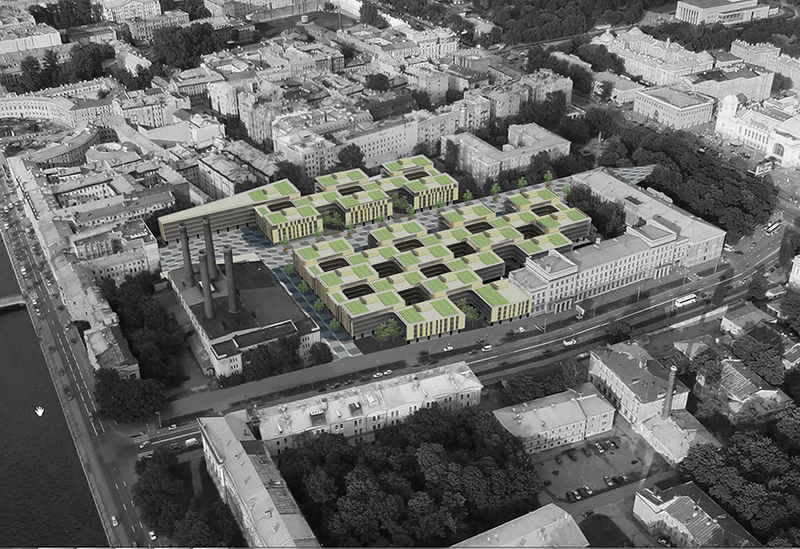 The masterplan since inception of the city, avenues, long facing facades on a red line of the streets, ensembles, the horizontal shiluette- these are the crucial features which are mostly inherent Petersburg than other European capitals. Most of the above is shown in the project. But at first glance one recall only the front aPetersburg, forgetting what lies behind its representative facades. Narrow courtyards - that's where it hides the true spirit of the city and its identity. True, most urban planners refer to this phenomenon rather negatively. It is perceived as a side effect of pre-revolutionary urban planning model, with significant disadvantages. But there are some advantages. For example preservation of semi-private sphere in the yard. No less importance has the fact that the city becomes compact in the dense development. 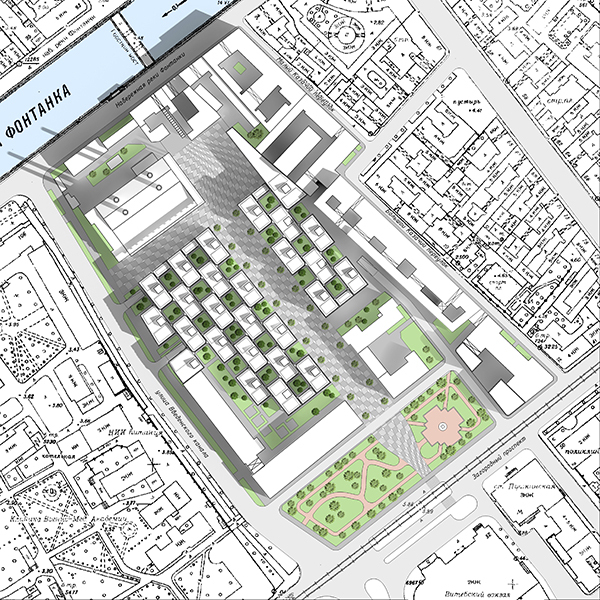 Our proposal comply all the insolation (direct sun in every apartment) and fire regulations and avoid any disadvantages of inner courtyards of old city. The site should be built up with a dense porous structure houses. Desired light and air penetrates through "pores" which are authentical cortyards. The entire first floor around the perimeter is given to the needs of commerce. The internal space of the first floor as well as roofs are only available for local residents. This model of development has a high density (up to 790 persons per hectare) in the total number of 4-5 floors. Thus, the new housing is very flat and does not destroy the established historical landscape with excessive height. The volumes completely subordinate to the already established dominants of St. Petersburg.